The department of Information & Public Relations and Journalism department of HP University jointly organised a function here today on National Press Day on the theme ‘challenges before media’.In his key address, senior Journalist and Bureau Chief of PTI P.C. Lohumi said a strong democracy was must for the freedom of media. Though, media was considered as fourth pillar of democracy, but the complete freedom of media could be ensured only when other three pillars were strong. He said credibility was need of all sectors but the credibility of media and judiciary was of prime importance to maintain peace and harmony in the society.He underlined that media should present the social issues in a right perspective to maintain its credibility. The reporting should be based on facts so that people continue to have trust on media. The another challenge before media was to maintain rhythm in the present era of information and technology. The print, electronic and new media should complement each other to ensure effective role of the media in the society.Shri Lohumi expressed concern over the cases of paid news in the media which he termed as a big challenge for credibility of media. 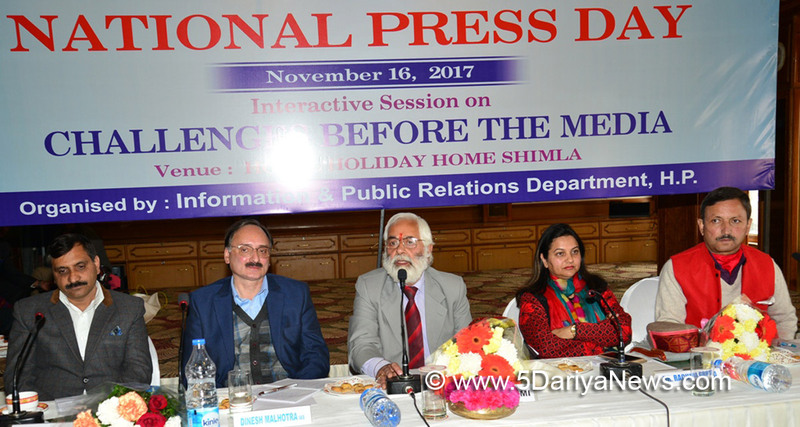 Director, Information and Public Relations Dinesh Malhotra said that media had been playing a significant role of strengthening the society and despite various challenges it had not lost its importance. We could not overlook the role played by the press in the freedom struggle and making of modern India. The social media had emerged as a new face of media in recent past but the print media was still equally popular and credible as was years ago.Shri Malhotra said that media was not only a guide but also a guard of the society. Every sector faces various challenges with the passage of time but with strong will power and efforts, we can scale new heights.Editor, News-18 Dr.Shashi Bhushan said that social media had changed the scenario of the media, however, the newspapers and magazines still holds the same importance. There had been a lot of changes in the form of journalism, which was once considered as a mission.He said today social media had come up as a challenge for electronic media but in near future it could be a rival to print media as well. Editor, Dainik Jagran Rachna Gupta said the importance of newspapers had grown up in the present age of information technology but at the same time various challenges had also come up. The foremost challenge was to keep the readers intact for which the newspapers need to present informative, latest and interesting information in an attractive manner. Moreover, the newspapers would have to keep in mind the interests of readers of various classes. She stressed the need on more research and reference for better reporting.Head of Journalism Department of HP University Dr. Shashi Kant Sharma said the social media was getting popular in the present times and it had come up as a big challenge to print and electronic media. Although the social media had no credibility and neither there was any control over it, still we could not deny its rising popularity. He said the number of newspapers was going up every year but at the same time it was necessary to work constantly for maintaining reliability of press otherwise we could not ignore the possibility that social media would over power these forms of media.The media persons and students of Journalism also participated actively in the interactive session.